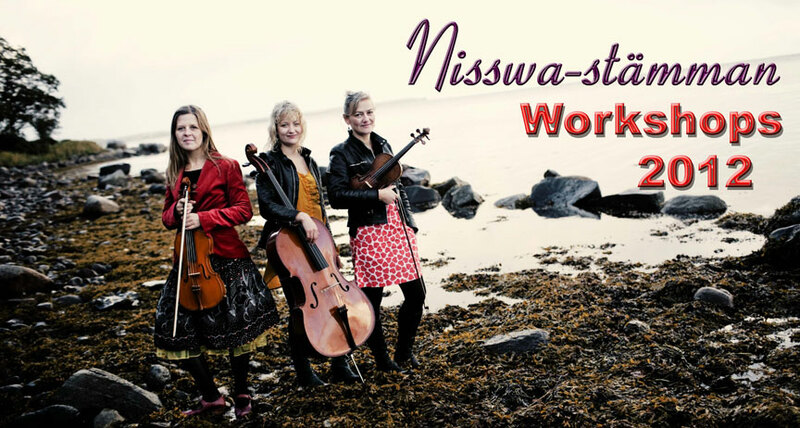 Scandinavian instrumental, singing and dance workshops, featuring top level musicians from Denmark, Sweden, Finland and Norway will take place on June 8, 2012 in and around Nisswa, Mn. These workshops are offered in conjunction with Nisswa-stämman Scandinavian Folkmusic Festival, June 9, 9, 2012. Sessions generally start at 10 a.m. and continue until 3 p.m., with a lunch break in the middle. There are some sessions that are half day only....check the listings. All workshops are generally taught by ear and participants are encouraged to bring recording devices. Cost for the sessions is $20 per each 2 hour session, or $35 for two sessions if they are from the same teacher. The 'musician's lunch' at most workshops happens at noon, and consists of cold cuts, vegies, fruit, etc and cost an extra $5. (note - no lunch provided at the dance workshops...but downtown Nisswa is right there with several restaurants available) After you signup you will receive more information about your workshop, including a detailed map for getting there. We are showered with TONS of lovely musicians again this year. This presents a blessing and a problem for us. The blessing is obvious. The problem is not so obvious, but is simply this: We may have trouble filling all the workshops with students. Two things need to happen: 1) everyone who took a workshop last year needs to return. 2) more people need to sign up. If you know of anyone who may be interested, please pass the word... think of any scheme you can to get the word out in your community! Thanks! Workshop locations - Click Here to download an overall workshop location map - this will assist in your planning. After you have registered you will be provided with detailed maps for each location. Workshop teachers, descriptions - Click here to download a pdf file of this page, for printing out. 10 am to noon, 1 pm to 3 pm - intermediate/advanced Swedish fiddling with Pär Näsbom . . . Since the age of 6, I have been around and played with some of the great Uppland, Sweden fiddlers. Most of the tunes I have learned from the legendary "Viksta-Lasse", a heritage I'm very proud of. I have great experience teaching in groups from my youth, as a leader and teacher of "Torslunda-gänget", as well as many summer courses. Today, I live in Winterthur, Switzerland, where I live with my family and work as a musician. The tunes in this intermediate-advanced fiddle workshop will be drawn from traditional tunes as well as tunes I have composed. Please bring a recording device to record the workshop. 10 am to noon – Norwegian Flat-Fiddling with Tonje Lien Barkenæs . . . Tonje Lien Barkenaes come from Nannestad, in Eastern of Norway. She started to play the fiddle 9 years old, and has studied traditional Norwegian music at the "Ole Bull Academy" in West- Norway for two years. Today she works as a physical therapist, and plays the fiddle in Syvers orchestra. The tunes that will be played in the fiddle workshop mainly come from Ottadalen valley, a geographical area with strong traditions in Norway. The tunes will be learned by ear, and the participants can bring recording devices if they like. 1 pm to 3 pm – Norwegian Flat-Fiddling with Andrea Een . . . Andrea Een has taken 11 musical research trips to Norway. She learned in direct tradition from master fiddlers in Voss where her grandfather, Knut Een, was born, as well as in Telemark & Setesdal. She will teach tunes from Gundbrandsdalen learned from Hans Brimi and from other fiddlers in Norway (Vestlandet and the Stavanger area). 10 am to noon, 1 pm to 3 pm - Swedish Nyckelharpa with Torbjörn Näsbom . . . I grew up immersed in music. Two older brothers who played and who later became professional musicians, and my father, music teacher Lars Näsbom. Mother, luckily, was ‘normal’ and kept the family on track. I started playing fiddle at the age of seven, and would visit such luminaries as Viksta-Lasse and Eric Sahlström, who became my great teachers of spelmanslåtar. I will teach from the tradition of those two great men. In 1984, I started to play nyckelharpa, first under controlled conditions but then less and less so, so nowadays my use of the nyckelharpa can be considered ‘provocative.’ I will try to teach how to get the real polska feeling when playing nyckelharpa. I will teach tunes mainly from Uppland. I also love to teach nyckelharpa technique that really improves the capacity to play well. Ensemble workshops are open to all instruments and will cost $20 for each 2 hour session session. Besides learning some neat tunes.. you basically will be getting a private house concert from one of the best gammaldans bands in Norway. 10 am to noon - Fiolministeriet teach the old Danish tunes of Rasmus Storm, Rewentlow and the Brothers Bast. . . (Besides learning tunes, you will be treated to a mini concert from a fabulous trio, too!) In this workshop we will teach you some of the old Danish folk music which is rarely played and is different from the hopsas, polkas and waltzes which is the most common Danish folk music. The music from the 1700 century has the influence from the English music and has also a little more in common with the classical music. The most famous manuscript books from that period is “Rasmus Storm’s Manuscript book” from 1760, “Rewentlow’s Manuscript book” from 1799 and the “Brothers Bast “from 1761. You will learn the tunes by ear but we will bring sheets with the music. 1 pm to 3 pm - Harmonium (pump organ) as it accompanies Fiddle Jonathan Rundman . . . In traditional Finnish pelimanni bands the instrumentation includes fiddles, upright bass, and oftentimes a harmonium (pump organ). For keyboardists/pianists, playing harmonium in Nordic music is a lot of fun and provides an essential part of the band's rhythm section. If there's no bassist, the harmonium can serve as the entire rhythm section itself! In this class we'll study a few simple Finnish tunes, and explore different styles of harmonium accompaniment. We'll look at chord voicings, bass lines, reharmonizations, and some experimental approaches as well. Harmoniums are hard-to-find, hard-to-repair, and hard-to-carry, so students are welcome to bring an electric keyboard (preferably with a "reed organ" or "accordion" setting) to the workshop. Of course, if you have a portable and functioning harmonium / pump organ, you're very welcome to bring it. We'll have 3 or 4 real harmoniums on site, too, if you'd like to try to play and pump! At the end of the harmonium workshop we'll join Sara Pajunen's fiddle workshop participants to play a few Finnish tunes with the fiddlers! Jonathan Rundman is a multi-instrumentalist and songwriter, and plays harmonium in the Finnish-American folk duo KAIVAMA. 1 pm to 3 pm - Swedish songs with Anders Larsson. . . Anders Larsson is one of very few active professional male Swedish folk singers. Originally coming from Strängnäs in Sörmland, Anders represents the music and tradition from the eastern parts of Sweden. Nowadays, Anders lives and works as a folk music teacher in Malung, Dalarna. His workshop will include songs with texts in Swedish (surprise? ), with and without second voices. Since Anders is one of Sweden’s most popular dance music musicians, the workshop will also include some lilted dance music. We have four dance workshops again this year. That's a lot of dancing , so please TELL YOUR FRIENDS! We need all the dancers we can get, and then some. The workshops will take place in two locations, at the Nisswa American Legion and in the Dance Barn at the Nisswa Pioneer Village. No lunches are available with the dance workshops....you can eat in Nisswa at the Legion (great lunches!) or several other restaurants. Participants are encouraged to have smooth soled shoes. You do NOT need to bring a partner! 10 am to noon - Easy to learn basic Scandinavian couple dances with Anders & Maria Larsson . . . Swedish Dance - introduction! Together with Anders and Maria Larsson you get an opportunity to get to know a couple of Swedish traditional Couples dances. Though the dances are pair-dances you are welcome as a single person. The start of the workshop is Anders's "Home dance", Sörmländsk Slängpolska. After that we give schottis a try! Everyone is welcome!! Beginners EXTRA welcome! 10 am to noon - Tango with Tuttila! Ralph Tuttila . . . Finns got heat, yes the Sauna sizzles but their tantalizing tango truly rules. Learn to dance Finnish Tango with Rauli Tuttila with assistance by Patsy Larkin. No partner needed ( we will rotate partners) couples singles all welcome. Finnish Tango is seriously sensual but Nordic friendly and fun. 1 pm to 3 pm - Norwegian Telespringar dance Carol Sersland w/ Loretta Kelley on hardingfele . . . Telespringar is a Norwegian village dance from the region of Telemark. Carol Sersland will lead the dancing with the hardanger fiddle music by Loretta Kelley. Telespringar is a free-style couple dance in which the dancers use a series of dance figures to build the final form. In this sense it is much like swing dance. The dance builds from a few elementary maneuvers which are accessible by all dancers to more difficult maneuvers which make it fun for more experienced dancers. The rhythmic music (in ¾ time) is lively and drives the dance forward. Carol has been dancing Telespringar since a young age when her father, who learned to dance Telespringar in Telemark, taught her. She has been leading and teaching Nordic dancing for many years. Loretta Kelley is an inspiring dance fiddler and total devotee to Telemark music and dance. Don’t be surprised if we add in some song dances and basic old-time dances for more fun! Take a look at some shots from the first workshops in 2004, with Mauno Järvelä & family of Kaustinen, Finland, > 2004 workshops.